Today is the start of summer orientation for Simmons College's Class of 2017. We are going to ignore the fact that 2017 sounds like a date out of science fiction and proceed to my strange experience interacting with the almost first-years. My strange experience basically consisted of thinking, "Wow. They're idiots. Was I this much of an idiot?" Yes. I was. They don't know anything about college. Nothing at all. One kid (I've relegated them to children even though I was them two years ago) asked if we had different classes every semester. That question is so high school. In high school you take English for four years with little change in content or approach. Yawn. How did we survive that monotony? Were our brains so narrow? One freshmen was from Arizona and didn't know what snow boots were. I may have forgotten my snow boots at home for a period of time this year, but at least I know the concept. It makes me wonder why last year I understood those confused little first years and this year I don't. I don't understand why they're all so nervous. Simmons will take care of them. I don't understand why they are so shy. Don't they know that Simmons is the most empowering place they'll ever experience? I don't even understand what they don't understand. In just a couple moths their lives are going to be so full of thinking and learning that they will look at their past selves like idiots who make no sense. They can't see it yet. There was no particular class or experience I can attribute to whatever growth separated us, the me that went to Orientation and the me that is now, but a chasm has broken between the person I was then and the person I am now. Slowly, over time I've been brainwashed into thinking college is the best experience a person could have if they are looking to achieve personal growth. 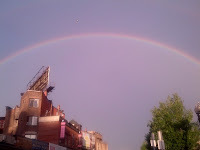 I went to the North End with the beautiful little fools to get pastries and stare at a rainbow. One of these pictures I took today. 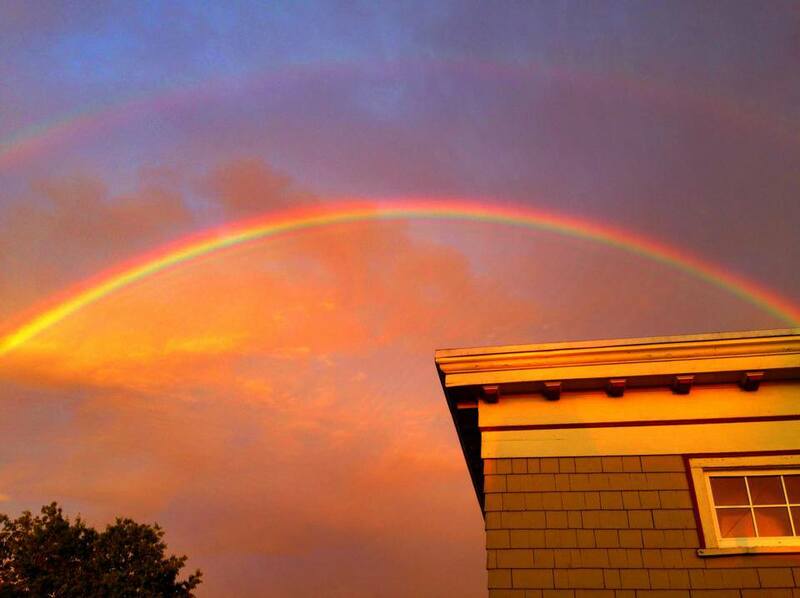 One I stole from Facebook of the exact same rainbow. My transformation over the last two years was caused by the light of a great institution, the university, coming towards me as a lot of different photons from different people and then reflecting off of a million little moments that were all falling in the entropy of time, but when looked at from far away is partly beautiful and partly magic. The change only makes sense as a sliver of a larger sky, but is a good part of that canvas. 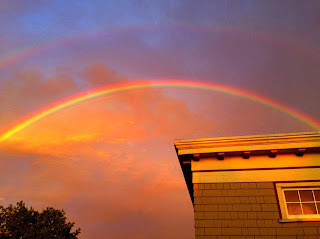 I'm happy with the rainbow Simmons has given me in the last year because even if it makes understanding first years difficult and it only exists from certain vantage points it makes my bit of sky a little more interesting.